Thanks to Iolanthe Good, daughter of Annalisa Crannell and granddaughter of Carol Jo Crannell, all featured above! My grandmother (Carol Jo Crannell, known to me as ‘Nana’) was a Phi Beta Kappa physics major at Miami University in the late 1950’s. 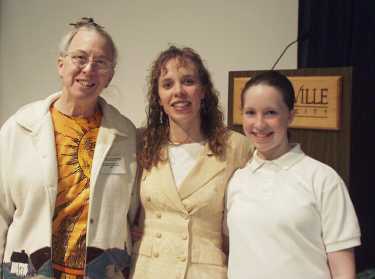 She went from there to Stanford University, where she got a PhD in physics (she also got married and had a child, my mother, who went on to become a mathematician). 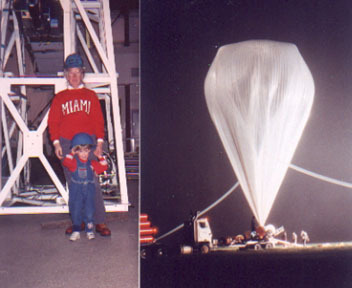 Her payloads often flew on high altitude balloons; this photo shows me at age 2 with Nana next to the gondola carrying her detector. On the right, you can see the truck laying out and filling up the 1000-foot ballon that will carry the payload. Later in her career, her detectors flew on rockets — so yes, my grandmother WAS a rocket scientist! P.S. I love the 3-generation picture you have of us in your header! This entry was posted in Mathematics, Physics and tagged Mathematics, physics. Bookmark the permalink.